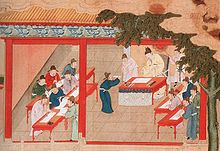 The imperial examination system in China is considered to be the first large-scale mental test in the world. The test is similar to modern psychological tests and it examines the knowledge of the candidates in topics such as civil law and fiscal policies. It is an interesting fact that early IQ tests were made mostly for entertainment than for analysis. What were used to evaluate the person’s intelligence are the most efficient thing now and then – the games. For example, the ancient Chinese game known as the “tangram” the game “jiulianhuan” or nine linked rings were used to show a person's flexibility and creativity of thinking. France is the country where the modern mental testing has began in the 19th century. They are very important in separation of mental retardation from mental illness.The Englishman Francis Galton combined the terms eugenics and psychometrics and the result was a method for measuring IQ using nonverbal sensory-motor tests. But it was rejected after the discovery that it has nothing common with the college grades for example.